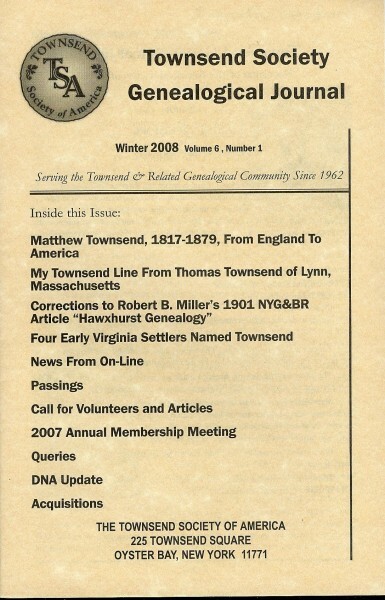 The Townsend Genealogical Journal is published and distributed to all members. The Journal format started in January 2003 and continues the 40+ year tradition of the Townsend Topics and Townsend Newsletter previously published by the Townsend Society. The Townsend Topics and the Townsend Newsletter 1963-2001 are available on CD -- check Townsend's Store on this website for details and how to order. Each issue contains sixteen or more pages of Townsend historical and genealogical information. Back issues are available for viewing and downloading in the members-only section of this web site. All issues are fully searchable. The Journal itself makes the cost of membership in the Townsend Society worth it!